Last Thursday, Oct. 17, a Palestinian named Younes al-Radaideh, from Beit Hanina, rammed a tractor he was driving into an IDF base north of Jerusalem in an attempted terror attack. He succeeded in breaking through the fence and rammed into buildings and several vehicles, injuring one Israeli, before being shot and killed by two soldiers. Reports indicate that Younes al-Radaideh is the brother of Marei al-Radaideh, the man who carried out another terror attack involving a tractor in March, 2009, in Jerusalem. 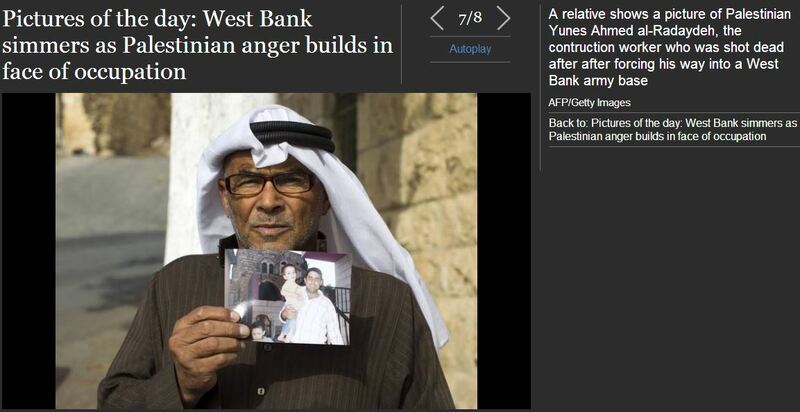 The Independent’s coverage of this latest terror incident consisted of the following photo (and accompanying caption) in a photo story titled ‘Pictures of the day: West Bank simmers as Palestinian anger builds in face of occupation’. A relative shows a picture of Palestinian Yunes Ahmed al-Radaydeh, the construction worker who was shot dead after forcing his way into a West Bank army base. 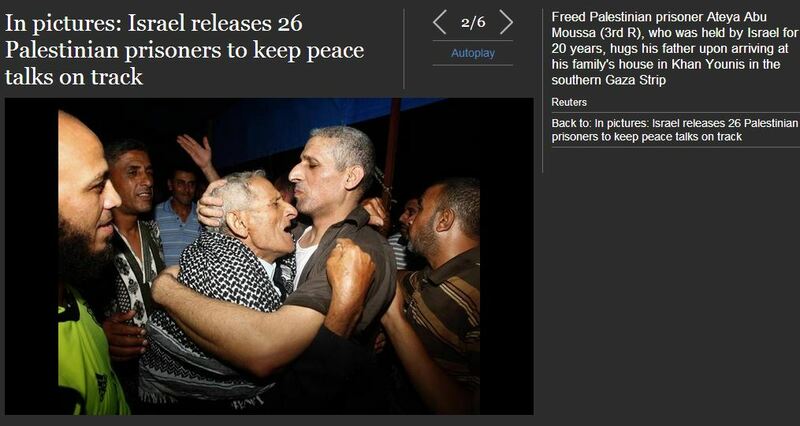 In addition to the misleading nature of the caption – which seriously downplayed the potentially lethal attack – the Indy’s decision to highlight the family of the perpetrator mirrors their use of photos in a story on July 28 about Israel’s decision to release 104 Palestinian ‘pre-Oslo’ prisoners – a group largely consisting of terrorists who murdered or attempted to murder Israeli citizens. The Indy evidently didn’t deem it worthy to note that Ateya Abu Moussa had been imprisoned for murdering an Israeli Holocaust survivor named Isaac Rotenberg in 1994. Whilst, fortunately, no Israelis were killed in the terror incident on Thursday, the decision by Indy editors to again highlight the attacker’s family represents another example of the moral inversion continually on display in British media coverage of Palestinians who attempt to murder Israeli citizens. It’s basic journalism this: to find the human interest angle. And the human interest angle here is the families of the terrorists. I’m no fan of the terrorists, but your post slightly misses the point that this is a general tenant of journalism, and not specific to Israel/Palestinians. And the human interest angle here is the families of the terrorists. Maybe my interest is less human but I’m much more interested in the families of the victims of these animals. Peter, of course you are right. The reason, however, that the Guardian, Indy etc keep publishing pics like this is that Pallywood are happy to get the relatives to pose for them and they will pump them out across the world at every opportunity. Israel has on the whole, by contrast, taken the strong position that victims and their families deserve privacy, so we don’t get scenes of wailing Israeli Mums at the graveside or crowded streets at funerals on the international MSM. The one exception in recent years was when Gilade Shalit was freed. There was lots of positive sympathy for him and his family who were tastefully made available to the media. Perhaps this is a model of how Israel could improve its PR strategy. By the same criteria one should justify and heap sympathy on the oppressed family of elementary school shooters.